Oil spills on water? No worries! XtraSorb is a 100% cellulose oil and fuel absorbent for use on water. It is completely biodegradable and is produced from recycled waste cellulose materials. XtraSorb is highly oleophilic (“oil loving”) and will readily attach itself to all forms of hydrocarbons. It will absorb up to 19 times its own weight in oil based products — even when wet! The protocol for the application of XtraSorb recommends that sufficient amounts of the product be applied to the surface of the spill to completely cover the spill. The spill will be quickly wicked up off the water and the spent XtraSorb can be retrieved by skimming or through the use of nets. XtraSorb is designed for use on small-scale spills on harbours, docks, wharves, marinas, re-fuelling depots, beaches, bird sanctuaries, reefs or mangrove areas — wherever an oil spill could occur. XtraSorb may be used on its own (loose) or in the form of socks, booms, pillows, or bilge ‘rats’. XtraSorb is spread over a spill surface and, unlike most absorbents, will absorb trace water and eliminate sheen. XtraSorb is particularly well-suited as a filtration medium for removing hydrocarbons from storm water collection systems, sump pits and interceptor systems. Rapid absorption on water — rapid wicking action makes XtraSorb ideal for use in sensitive eco-systems. 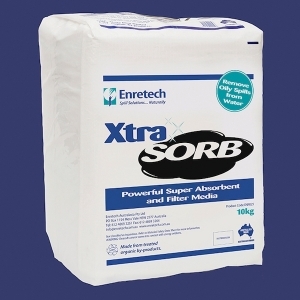 Safe and easy to use — XtraSorb is environmentally inert, posing no dangers to flora, fauna or aquatic life. Its high buoyancy also facilitates containment and retrieval. Cost-effective — high absorbency means only small amounts need to be used, so it’s highly cost-effective. Produced from recycled raw materials — 100% cellulose, biodegradable and non-abrasive. XtraSorb is also incinerable, generating 15,500 BTUs/kg with less than 5% ash. EPA approval — for disposal to solid waste landfill (regular garbage) in most states and territories.